Q&A from Allure Magazine March 2013 issue. Do you smell your own perfume on other people? "I once sat next to a woman who smelled strongly of cigarettes and also of First [his perfume for Van Cleef & Arpels]. They were parallel scents -- not necessarily agreeable, but I accept it." Does scent ever influence your opinion of a person? "There are odors that influence me enormously. Alcohol. Of course I detect that at once, and along with that, understand the melancholy, the unhappiness of a person I meet. I am not talking about a little alcohol, but the smell of habitual dependency." 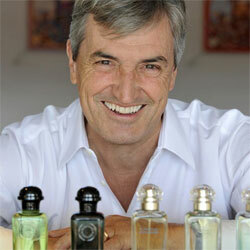 Are there any fragrances that give you a false impression of someone? "Yes, very strong perfume. That may lead me to believe the wearer is a very strong woman with a strong personality. However, that may not be necessarily true. The perfume defines the woman at first, but sometimes that really isn't her." Can perfume make a woman more attractive that she really is? "Perfume is an artifice, like lipstick or a new dress, except unlike lipstick, it's an invisible artifice. It's all a very subtle game that can make a man thing, I am attracted, or, There's too much character in her, I need to distance myself. It's a game men and women play, and they don't even know what they are doing."